In sequence of the previously posted essay, ‘Barrackpore, a little Calcutta’, I am tempted to bring about the subject once again to share with you the fascinating details of the making of Barrackpore House and the Park as revealed in ‘The Story Of The Viceroys And Government Houses’ of Marquis Curzon of Kendleston. Curzon started his research during his Viceroyalty (1899-1905), continued with it, and finally readied his work for Cassell to publish in 1925 before he took rest in peace. A condensed and revised version was published in 1935 entitled, Story of Government houses by N V. H. Symons. Although Curzon had a fond association with Government House at Calcutta as it was modelled after his ancestral manor Kendleston Hall, he took every care to follow faithfully the crazy path of history of the Barrackpore estate since Lord Wellesley started it all by himself. Barrackpore is complementary to Government House in the same way that Viceroy Lodge, Simla, is complementary to Viceroy’s House, New Delhi. The Governor General used to spend the whole of the year in Bengal, apart from tours, Barrackpore being his habitual summer residence. [Symons] As Stravornius had mentioned in 1768, Belvedere might have served as Barrackpore did after Wellesley [Cal. Rev, Dec.1852]. Even after 1864 the Viceroys and the Governors of Bengal used Barrackpore House as a country house for week-ends. 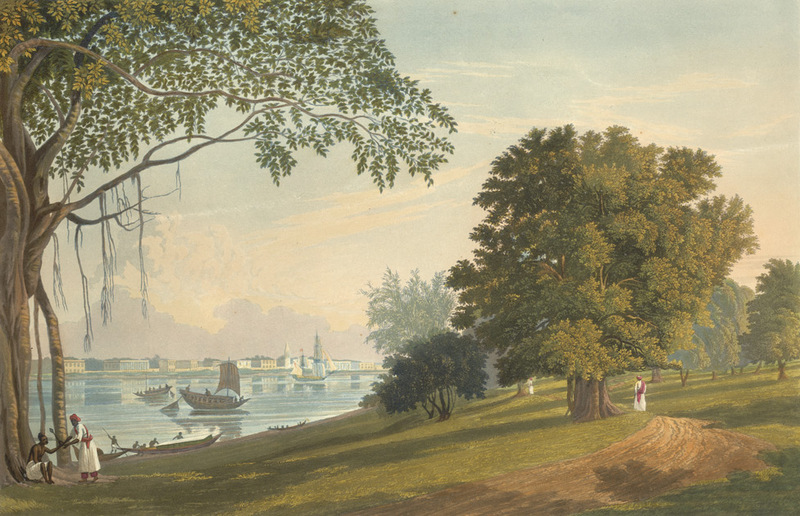 The English lady traveler, Monkland, to my mind, described best what Barrackpore was in early 19th century. [Monkland]. Barrackpore was then having ‘a quiet and retirement like air’ of countryside that combined with its military neatness and propriety making it ‘one of the sweetest places in India. ‘The bungalows in four lines stand each separated from the others, every one surrounded by its own corn-ground, flower-garden, and neat trimmed hedge; while the whole cantonment is at right angles intersected by well kept roads, smooth as bowling-greens, and has the river in front and the parade ground in the rear. Government-house, and its beautiful grounds, are merely separated from the cantonments by a piece of water from the river, over which there is a bridge; and the park, as a drive, is at all times open to the European inhabitants.’ [Symons] Seemingly, nowhere else the Britons raised an exclusive white town as satisfyingly as they did it in Barrackpore. To the natives of the town, লাটবাগান (the Park) remained a prohibited place. And then retired, and left it in this dismal hash. By the order of the Court of Directors the construction work of Barrackpore House was suspended. The beams, doors, and windows, etc. were sold by auction. The shell of the house stood for some more years until Lord Hastings finally cleared the ground and put up a Green House there. While constructing his dream palace, Wellesley stayed in a temporary accommodation he had made with three large bedrooms opening on to a wide verandah to the North-West. This bungalow happened to be the nucleus of the future Barrackpore House. The three rooms made up the central block of the new building. Sir George Barlow (1805-1807) erected small rooms at every corner of the southern verandah. Lord Hastings (1813-1823) added side wings, a Portico, and the upper Entrance Hall that was used later as a billiard room. These structural changes, however, ruined the prospect of its being a good summer residence. What needed was “a series of rooms which will catch the South breeze at night” – this condition was fulfilled by the original three-roomed house. It was Hastings who shaped the house into its final form, and took interest in glorifying the building with appropriate decorations. The lovely lotus basin and the marble fountain installed in front of the South entrance, were two such decorative pieces he brought from Agra. By doubling the building area he also ensured a comfortable accommodation for the Governor and their family members and some guests as well. No other structural changes were attempted ever since, except for some minor modifications and additions of certain features. Lord Auckland (1835 – 1842) added the balcony on the Western side; Lord Lytton (1876-1880) replaced the unseemly iron staircase on the South front. Lord Ripon (1886-1884) installed a wooden porch In front. Lord Minto (1905-1910) equipped the building with electric light, laid the floor in the drawing room and redecorated the entire house. The house has always been used as a place of relaxation and recreation. Within the house there have been balls and entertainments, and also services were being held at the large central drawing room before Barrackpore Church was established in 1847. Here, Bishop Heber preached in 1823. Carey, Marshman and Ward, often visited Barrackpore House as guests of the Governor General. ‘Barrackpore Park was created by the taste and public spirit of Lord Wellesley’. [Carey] It was believed that he had a desire ‘to have brought all the public offices up from Calcutta and established them in the vicinity of the park’. From his day-one in Barrackpore, Wellesley started acquiring land for developing the Park. The whole park-area was nearly 350 acres, and the cost of the land acquisition amounted to £9,577. It was originally a flat land covered with swamps and jungle. 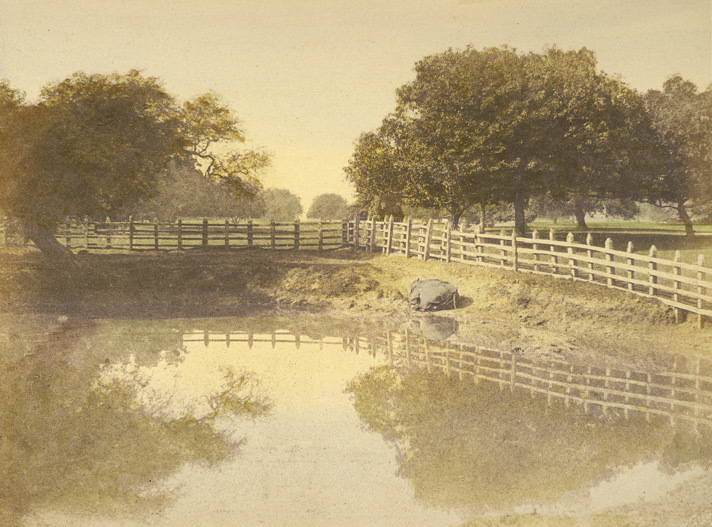 Wellesley converted this landscape into an English Park by engaging convict labour to do the task of draining, clearing and shaping the land into hillocks and dunes, and installing pieces of ornamental water. In the beginning there had been little or no distinction between the Park and the Garden. It was through a gradual process the Park turned out to be a public-access property. The Gardens grown within the Park remained private. There was, however, no borderline between the two, and the public roads ran through the Park and the Garden areas as well. A detailed plan of Barrackpore Park, reproduced here from Lord Curzon’s book, The story of the viceroys and government houses, helps us to understand the distribution of items described by him and other narrators. The Park looked best at the river-side. Barrackpore House stands nearest to the Nishan Ghaut – the platform for landing ships. Lady Canning (1856-1861) made a raised pathway leading from the house to the upper landing stage, and much later Lord Ronaldshay (1917-1922) made a bridge from there to the landing stage. Some other old bungalows are found close by. Bungalows#1 and #2 were designated for the guests while the one at the Eastern side, the Military Secretary’s quarter, was better known as ‘Honeymoon Bungalow’ because of its being available on rent to newly married couples. On the North-West Beach stands the Flagstaff – a broken up mast enshrined in memory of the flagship HMS Kent, smashed in 1757. The bungalow next to it is called ‘Flagstaff Bungalow’. Lord Wellesley had a good amount of time to devote for developing the Barrackpore Park before he finally resigned, leaving his other project, Barrackpore House, abandoned. 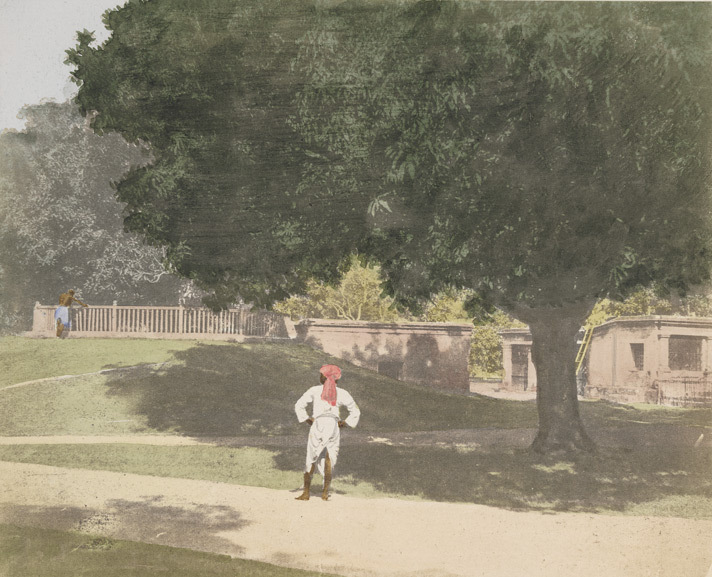 He had completed many other constructions inside the Park, including a stable for 36 horses and standing for four carriages together with a coachman’s bungalow; he erected the balustrade bridge over the ‘Moti Jheel’ lake to the North of the House, an aviary for large birds, and also a menagerie in the North-East corner of the Park. The Menagerie existed there till the Zoological Gardens at Calcutta were opened by Edward VII as Prince of Wales in 1876, where most of its collections were transferred. 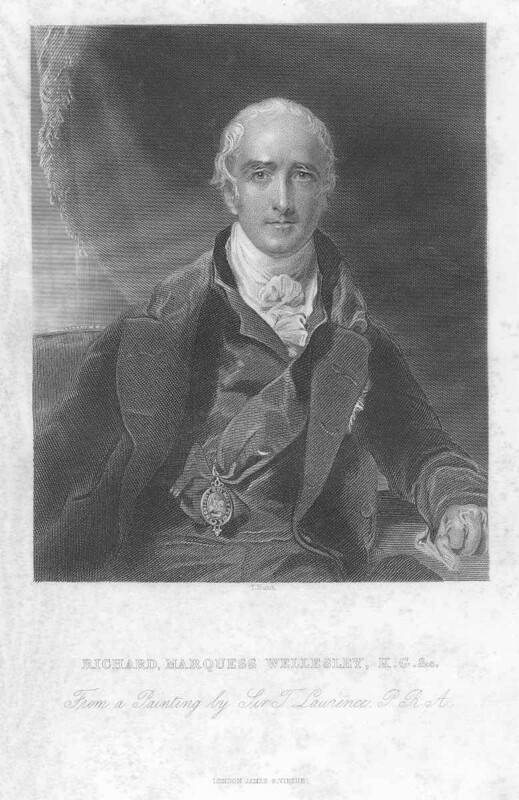 Wellesley had constructed the high way from Calcutta as the first section of the Grand Trunk Road, and planted trees on either side before he handed over its charge to his successor, Lord Cornwallis. 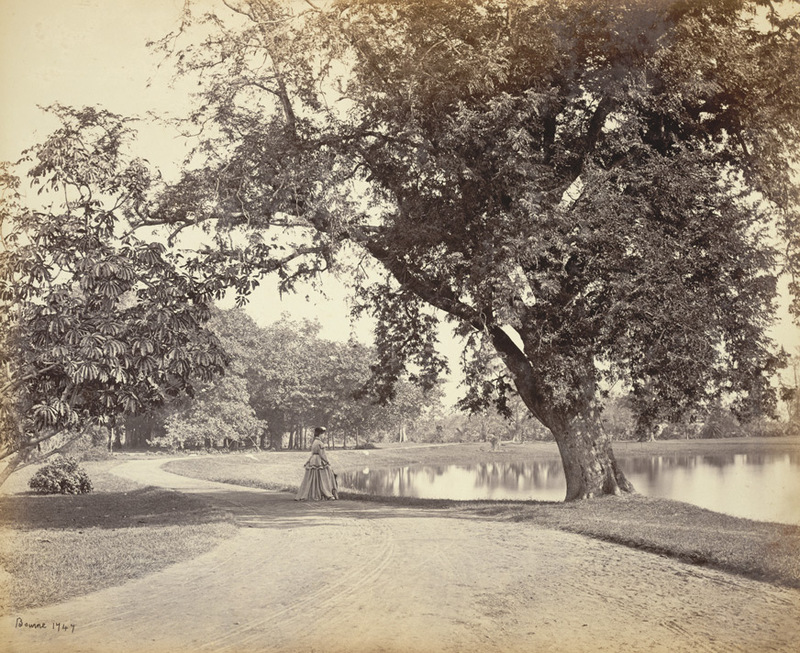 Wellesley might have also planted the mahogany trees on both side of the shady road known as ‘Mahogany Avenue’ as the cross-dating of tree-rings suggested. On the other side of the Avenue, Lord Curzon grew a fine rosary with a large circular lawn surrounded by pergolas. Lord Minto construct¬ed a large stone basin and fountain, 40 feet in diameter and holding 23,000 gallons of water. Though intended for the rosary, the basin and the fountain were placed in front of the Seed House and often used as a bathing pool. 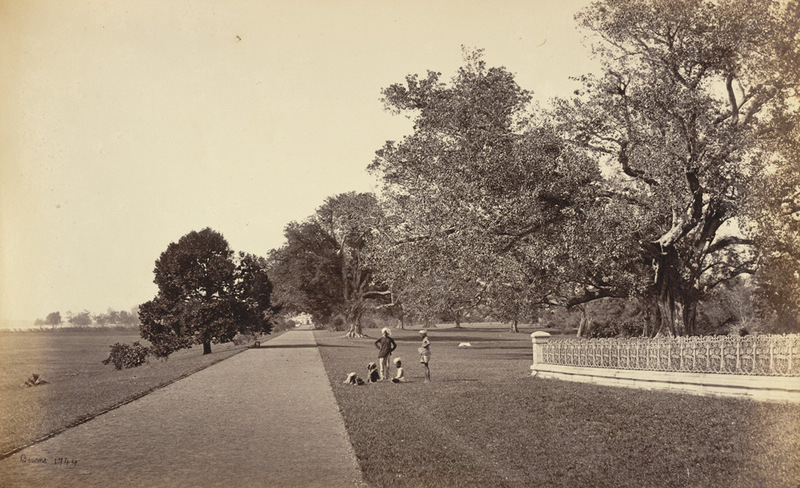 There have been many more formal gardens in the Park designed and developed by the successors of Wellesley. Lord Auckland (1835-1842) had started an aviary near the Lily Tank, which is also called ‘Aviary Tank’ in reference to his lost aviary. The ‘Deer Tank’ ,situated in between the House and the ‘Temple of Fame’, was made by Lord Lytton (1922-1927) for the half-a-dozen deer he had brought from Barisal in an attempt to revive the charm of the old time Park. The name ‘Rhinoceros Tank’ brings back the memories of Lord Wellesley’s menagerie. Likewise, the word ‘bustee’ reminds us of his aviary once existed opposite Chiriakhana. Moti Jheel, the long tank, near the ‘Temple of Fame’ stretched up to the Cantonment church, had been a prolific breeding ground for mosquitoes. Lord Curzon arranged to drain and turf Moti Jheel, and Lord Minto filled it further along with other restoration works he undertook. Minto built the magnificent ‘Temple of Fame’ following Greek style – a tribute to the 24 officers who fell in the conquest of Java and Mauritius in 1810 and 1811. Lady Canning (1856-1861) made some memorable contributions toward improvement of the Park facilities. She had built a road from the House to the new landing stage, which was converted into a leafy tunnel of bamboos by Lady Ripon in 1880. On the South of the house, she put the pillared balustrade round the semi-circular terrace and planted blue Morning Glory to grow over it and spread out over the giant Banyan tree. The tree was 85 feet high; and with nearly 400 aerial roots it covered an area of 60,000 square feet; It was smaller in circumspect but older than the Shipbur Ba-nyan tree. 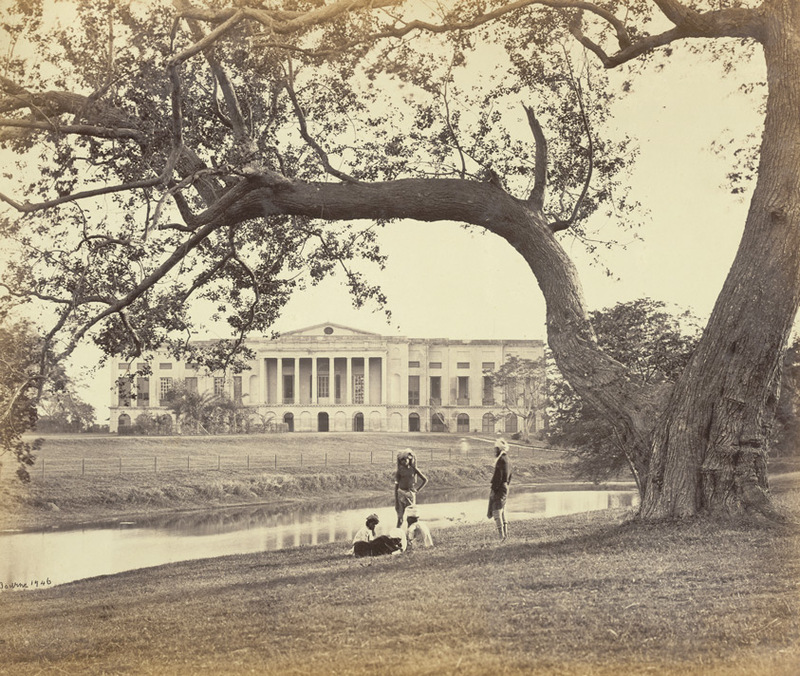 Lady Canning realized the possibilities of the great tree as an outdoor pavilion. Under the shade the members of the House and their ho-nourable guests liked to spend whole day, enjoying the meals and refreshments served there, and perhaps watching games on the Tennis Court from distance. Beneath the shade of Banyan Tree many a viceregal *tiffin-party had assembled. There was also an excellent Golf Links much resorted to by Calcutta folk. One of the most beautiful sites in the Park was the grave of Lady Canning, 500 yards down the river bank from the House. She died in Calcutta and, as her husband wished, buried in Barrackpore Park where she, a proficient painter, used to sit in the quiet. Bishop Cotton consecrated the ground. Her sister, Lady Waterford, designed a monument for her grave – a large mar-ble platform ornamented with inlaid mosaic. The monument, for its proper up-keeping, was required to be shifted in 1873 to Calcutta Cathedral and from there to other places until the relic found its place at the North portico of St John’s Church. To the North of the House, near Flagstaff there was a tall masonry tower, and some more were found along the road. According to Lord Curzon, those were semaphore stations for the Governor General’s use but abandoned after installation of the Telegraphic system in India. There are, however, some official records suggesting that the towers were built by Colonel Everest in 1830 for his Trigonometric Survey. To the West on the river-side there was a masonry chabutra on which the band used to play English tune flowing over the hillocks and dunes of the Park. To complete, the illusion of English scenery, Lord Wellesley, wished for a constant view of a Church spire. To fulfill that wish, Wellesley spent unhesitatingly a sum of Rs. 10,000 towards the building of the Danish Church at Serampore – a church adhering to non-Anglican creed. 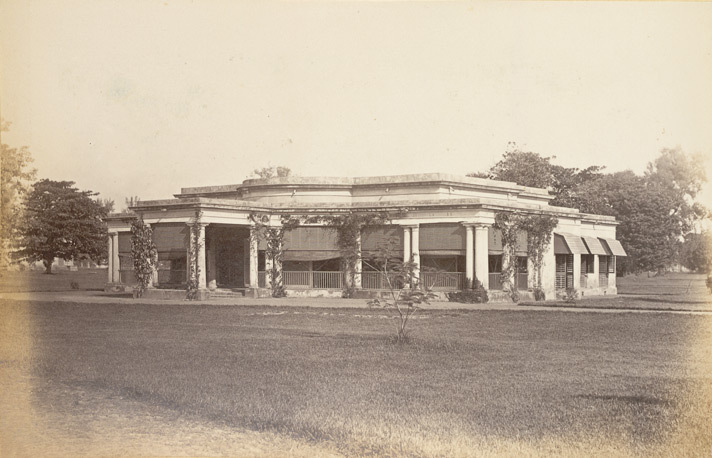 The chronicle of the Government estate at Barrackpore may serve as a unique case of colonial architectural experience of a century long endeavour by different masters with variant ability and outlook – the Governors General, Viceroys and Bengal Governors, whoever considered the place their temporary home, had attempted to make things changed their ways for improving conditions of living in Barrackpore House. The Park is almost like a huge collage of English landscape composed collectively by talented men and women, in succession, adding patches of vibrant colours and forms of their choice, and most significantly, adhering to a thorough English style. The Hand-book of India: A Guide to the stranger and the traveller… / Joachim Hayward Stocqueler. 1845. Life in India; or, the English at Calcutta / Anne Catharine Monkland; v.2. 1882.